Who is this guide for?SEOs and developers who are considering building a PWA that’s both user and search friendly. A few years have passed since mobile traffic overtook desktop and, even today, mobile website speed and usability remains poor on many mobile websites. This is why users are three times more likely to reopen a mobile application than a website and several studies show that users spend 86% of their time on mobile apps and just 14% on mobile websites. Another reason why people end up installing apps for frequent use is that mobile apps have the ability to work offline, negating the need for an internet connection to access web content. Finally, mobile apps consume less data and are much faster than mobile websites; this is because apps usually store their data locally on mobile devices, in contrast to websites that generally use web servers. However, native apps also have some limitations and challenges. In order for a user to start consuming your app’s content, they’ll need to complete a number of steps first: find the app in the app store, download it, install it and, finally, open it. According to this study, apps can lose 20% of their users in this process. Furthermore, native apps’ content is not-findable, takes a lot of phone space, requires constant updates and, in many cases, will eat your phone’s battery quickly. It’s recommended to add the manifest link on all your site’s pages so it will be retrieved by Google when the user first visits the application, no matter what page they land on. To read more about the web app manifest file and how to create one, you can check Google’s recommendations here. Furthermore, by caching all static resources with the service worker, it could drastically reduce the network requests and improve performance considerably. For details on how to register and install a service worker, you can read this article. One of the prerequisites to deploy the service worker on a site is to have HTTPS set up on your server. This is due to the service worker’s ability to hijack connections and fabricate and filter responses. For this reason, and to protect data integrity, you can only register service workers on pages served over HTTPS. This approach allows users to have faster experiences (especially for repeat visits) and allows for native application-like navigation and interactions offline. 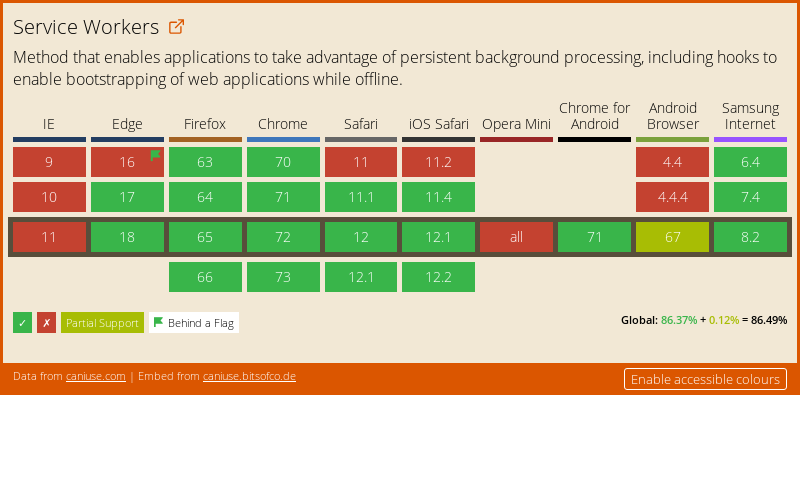 All modern browsers now support PWAs but some of their functionalities might still not be supported by some older browsers. Fortunately, this is changing quickly. You can check the browser compatibility of the PWA’s main features mentioned above on the “Can I use” website. PWAs can also be combined with AMP-based sites. One of the main benefits of PWAs is their ability to provide fast load times, but this only happens after the first load, which means that a user may still experience slow load times the first time they use it. This is where AMP comes in. Click here for specific details on how to use a PWA and AMP technology together. In many cases the second wave of indexing will be deferred for a few days after Google first discovers a page, which can have serious implications for SEO. Due to these limitations, it is important that your server is configured to respond to requests for deep URLs with fully-rendered HTML for that page. This includes not just the application shell, but every element on the page: navigation elements, links, images, meta tags, content, etc. For pages that are requested by search engines where an HTML snapshot does not yet exist, prerender.io will also create and serve the snapshot on the fly (and cache it afterwards) but the response will take slightly longer so, where possible, you should ensure pages are cached via the API to avoid slower response times. To get prerender.io running, you’ll need to sign up, grab the Prerender token and then install the necessary middleware for your development stack, which will allow you to make proxy requests to prerender.io when a request is made by a search engine crawler, for the snapshot to then be served. You can refer to the Github repository and prerender.io documentation for further details. For more details on how to test and validate these features, check Google’s checklist for PWAs. The benefits of having a PWA will vary significantly depending on what your site or app does, your financial and development resources and whether or not this technology is right for your target audience. Before you start building your PWA, make sure this is going to have a positive impact on your business goals and objectives, as development will be resource intensive. Once you’ve built your app (if you’ve finally decided to do so), make sure you test it across all major browsers and devices, and that you validate its implementation with tools such as Google’s Lighthouse, and that you complete all the checks recommended by Google on their checklist mentioned above. Finally, don’t forget that this can have a huge impact for SEO – as well as other channels – so make sure you involve your SEO team from the planning stages to ensure this doesn’t have a negative impact on your current performance and that you maximise the benefits of having a PWA for the organic channel. What should be made into a progressive web app? Maria joined Builtvisible in early 2017 as a Technical SEO Consultant, where she works across a wide variety of projects. With a background of writing and Journalism, she is most passionate about the technical side of SEO and specialises in website speed optimisation. She speaks 4 languages and loves travelling whilst capturing landscapes with her camera.